Hartebeest are ungainly antelopes, readily identified by the combination of large shoulders, a sloping back, red-brown coat and small curved outwards, then forwards, and then backward horns in both sexes. The animal stand between 47–57 inches (117-143 cm) at the shoulder and can weigh anywhere between 312- 500 lbs (142-228 kg). Once the widest-ranging African antelope, they are now greatly reduced in numbers and range, but some 10 different populations distinctive enough to be considered different races survive south of the Sahara. 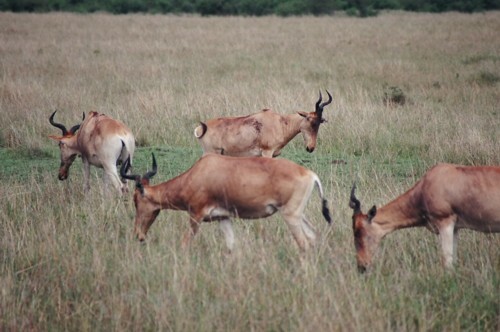 Coke’s hartebeest, a subspecies, is most common in Kenya. These antelopes have a slightly different social organization than others. The adult females form groups with their own offspring, rather than forming associations with other adults. The offspring sometimes remains with the mother for up to 3 years, which shows an unusual long bonding. Bachelors form herds as well, but they are less structured and age isn’t as big of a deal as for other antelopes. The conception and breeding phases are influenced by the food availability and babies are usually born throughout the year. They live in grassland and open forest where they eat grass. They usually spend the morning and late afternoon eating. The word comes from the Afrikaans languages and was originally called hertebeest. The name was given by the Boers who thought it resembled a deer. Herds contain five to twenty individuals but can occasionally contain up to three hundred and fifty. Predators are spotted hyena, lion, and leopard. Jackals occasionally prey on hidden calves. Good places to see them are the Masai Mara National Reserve, Nairobi National Park and Tsavo National Park.